Dr. Self is Associate Professor of industrial design, School of Design and Human Engineering, UNIST. He holds a doctorate in industrial design and worked for several years within the design industry in London and Sydney, Australia. Prof. Self is a commentator for Core77, and currently holds Associate Editorships and committee positions for a number of international journal and conference publications. Design works and research contributions include numerous publications, international design awards, patents, articles, exhibitions, seminars and workshops. Research and design projects include a broad field of interests, from design-driven innovation to social design. Research and design activities attract funding from various governmental and industry sponsors. Teaching portfolio includes under and postgraduate course provisions across various programmes. Current service responsibilities include committee Chair and memberships across a variety of internal (UNIST) and external organisations (DRS EKSIG, ICDES, KSDS). With background in marketing and design, Jisu’s interests explore the interface between product design, brand and marketing aspects to provide strategic design interventions. Wondo works at the intersection between product design and UI/UX design. 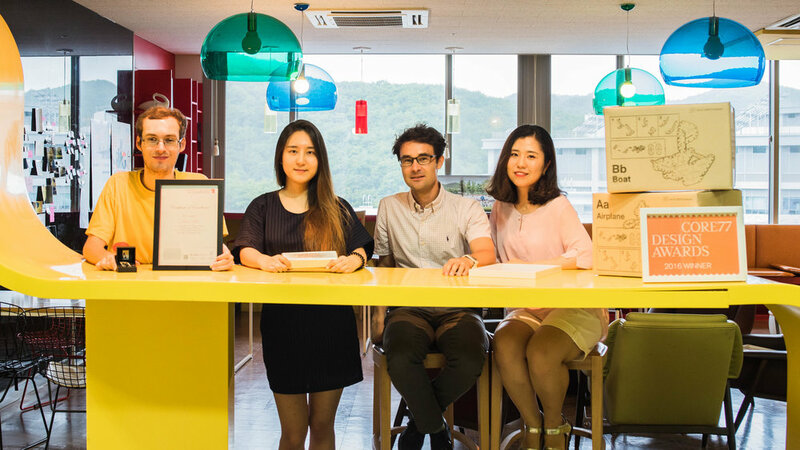 Having trained and worked as a UX designer in Milan, Italy, Wondo returns to Korea to pursue graduate studies in Creative Design Enginnering. His terminal graduation project provided a product design intervention in the education space to support peer-to-peer communication in online learning: FlipMe. Graduation and project works include work towards an AR prototyping tool and App. design for Hyundai Motors. Soyeon graduated with a double major in Management and Industrial design from UNIST. Currently Soyeon is working on avariety of industry sponsored project at the dpr.lab. She is also already an international award winning designer for her work on Reader Helper, a smart product for dyslexics. Interests concern the relationship between interaction design and innovation. Previous to joining the lab, Gee Hyuck graduated with a BSc in Industrial Design from KAIST. Gee Hyuck has already published research work on innovation & interaction design, attracting recognition as best paper. Seong Geun graduated with a Bsc in industrial design and MSc in creative design-engineering, both from UNIST. While at UNIST, Seong Geon achieved international journal and conference publication of his research works and attracted media attention for his Masters project in collaboration with industry partners. His works were also exhibited in Seoul, where he won special recognition. Younghoon Hwang holds a BA in industrial design from Kookmin University and an Msc in industrial design from UNIST. drawing upon his industry background as a CMF designer at LG, Younghoon's Masters thesis explored the interaction between colour, materials and finishes from the user perspective. Younghoon now works in Seoul as a designer. After graduating with an MSc in Industrial Design, UNIST EunJin worked, as a Research Assistant at the dpr.lab with an interest in design practices and the application of past experience during ideation. EunJin is currently completing her doctoral study at ID KAIST, exploring relationships between colour and design. EunJin's achievements while at UNIST included a number of outstanding international publications. Jane graduated from UNIST with a major in industrial design. After graduating, Jane now works at a design and branding consultancy in Seoul with responsibility for a varied portfolio of client projects. Bert worked as a summer intern at the dpr.lab, UNIST. His background as a mechanical engineer, together with his creative approach, provided an outstanding contribution to one of the lab's social design project. His efforts have been recognised in an application for design rights related to his design works while at UNIST.